Does anyone know anything about this table. I bought it @ an estate sale, it is very unusual. It is about 48" tall, 23" wide & 11" deep, has two beveled mirrors, one on top & one under top shelf. The top shelf is curved, has a short inset shelf in center under second mirror that has a skinny pedestal holding the shelf up. Bottom shelf is just oval. All shelves have beveled edges. I appears to be mahogany wood. Now that's a curiosity!! I don't think I've ever seen anything quite like this!! I'll certainly be tagging along to find out what it is though. Sorry I can't help, but it sure is unique! @Dianne I'm having a hard time making out all of it in the photo. Is the top shelf thingy narrow...like a hanger? If so it's probably a "Silent Valet" used to hold a man's suit jacket, keys, wallet etc. NO, Karen, it is not that narrow..it is kidney shaped about 7" deep. Ah, okay, that wouldn't be it then. Karen I thought the same thing, but the mirrors would have been covered. Dianne, is there any markings or stampings under the lower seat/shelf area? Knowing what time period or make will make looking this unique thing up easier. I have looked at several hundreds if not thousands of pictures of this type of table/shelf and have not seen anything that comes close. Same here @Woodbridge Environmental Tiptophouse.com - I sort of suspect this could be a reproduction piece with which some 'artistic license' has been taken!! @Dianne- do you think you could also post some pix from different angles as well? It's just such a strange and unique piece but totally makes no sense either. That skinny little pedestal in the center is just hard to figure out it's purpose. I think it's some sort of Gentlemen's Valet but . . . . . ????? I'm going to tag Kevin - @KMS Woodworks and see if he can lend his expertise. He knows alot about ALOT OF EVERYTHING!! Kev - can you shed any light on this?? I just got back from a few days at my cabin...@Susan S thanks for the tag...this is a very cool piece. I have never seen any thing like it, my gut tells me Antique...just not sure how old. The beveled glass and old time silvering of the mirror will help....I'll do some more digging when I get my in box cleared out...4 days worth of email...etc. Jeesh. This is truly strange....but then in the 1800s folks were building all sorts of little spaces to hold trinkets and this is probably one of them. The wood used and the carving at the top is a good indication of that period. It is definitely different from anything I have ever seen. All of these I have seen are much like the one KMS posted in his photo. Thanks @KMS Woodworks - I knew if ANYBODY could shed some light on this it would be YOU! 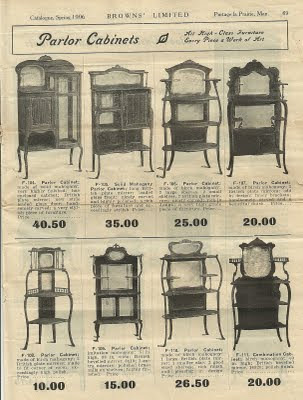 Another sent me this link to Sears 1908: http://2.bp.blogspot.com/-k_hVNWxJGm0/Tb7u5K6huYI/AAAAAAAAFzc/IfaAodDPOV4/s400/1906%2BParlor%2BCabinets.jpg http://2.bp.blogspot.com/-k_hVNWxJGm0/Tb7u5K6huYI/AAAAAAAAFzc/IfaAodDPOV4/s400/1906+Parlor+Cabinets. It's a hall table usually found near the entry at the front door. Change, glasses, keys, coat fits over the back as a hanger of sorts. 1890's to 1920's. Wood appears still lovely.